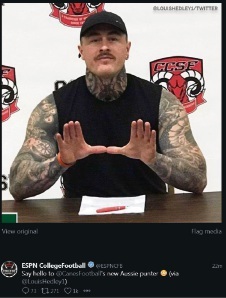 MANDURAH’S Louis Hedley is making waves after signing with the University of Miami Hurricanes on February 5. The Hurricanes announced the signing of Hedley as part of their National Signing Day class. At 193cm and 97kg, Hedley’s recruitment to Miami was well received. The Post went on to say Hedley, who is covered in tattoos, looked “nothing like your typical punter”. The former Peel Thunder reserves defender spent the past season at junior college level playing for the City College of San Francisco. Hedley’s recruitment to the Hurricanes means he is playing for one of the highest-profile football programs and is well on his way to a pro career. “Thank you to everyone that has helped me get to this point,” Hedley said on Twitter. Hedley worked for Prokick Australia and he thanked them for their help. Prokick Australia tweeted: “Those who know him understand that he has deserved every part of this. “He changed his life… now heads to Miami with a 3.7 GPA. Hedley will attend the University of Miami on scholarship while completing a degree.